Wabash College President Patrick E. White and Dean of the College Gary A. Phillips have announced the promotion and tenure of three members of the faculty. Biology Professor Patrick Burton, English Professor Eric Freeze, and Psychology Professor Karen Gunther have been promoted to Associate Professors and granted tenure at the liberal arts college for men. “Faculty up for tenure demonstrate that they are excellent in teaching, research and/or creative work, and service," President Patrick White said. "Professors Patrick Burton, Eric Freeze, and Karen Gunther have all achieved much already in each of these key areas and we look forward to their continuing growth and development as teachers, creative scholars and writers, and campus citizens leading the College to new heights." 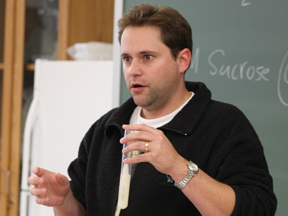 Dr. Patrick Burton joined the faculty in the Biology Department in 2007 after completing postdoctoral research at the University of Maryland. 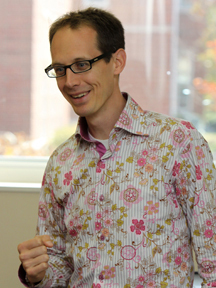 An honors graduate of Williams College, he earned his PhD from Boston University. His research focuses on the question of how some animals can develop their adult body plan multiple ways (e.g. embryonic, asexual, and regenerative development) while humans cannot. His research compares the molecular, cellular, and genomic mechanisms by which a species of sea anemone (Nematostella vectensis) accomplishes these three modes of development. 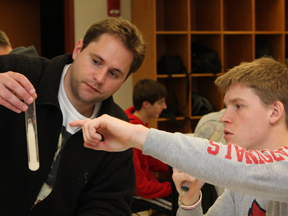 Students in Dr. Burton’s upper-level courses often work in his research lab investigating developmental questions through a mix of independent research, hands-on experimentation, and primary literature review. Dr. Eric Freeze is a native of Canada and earned his bachelor’s degree and master of arts degree from Brigham Young University. He earned his PhD in Fiction Writing from Ohio University in 2004. Before coming to Wabash in 2008, Dr. Freeze taught for three years at Eureka College in Illinois. His creative writing classes have become especially popular, and he has woven immersion learning trips into his courses. 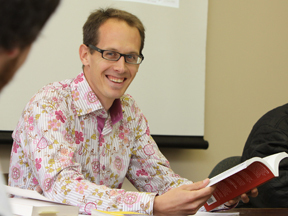 At Wabash, he teaches a range of creative writing courses, as well as classes on American Literature, Postmodern Fiction, and Contemporary Canadian Fiction. He has also taught Wabash’s all-college courses, Freshman Tutorial and Enduring Questions. Freeze’s other focus is research and writing. His stories, essays and translations have been published in a variety of literary journals including Boston Review, The Southern Review, New Ohio Review, and Tampa Review. His first book, Dominant Traits, is a collection of short stories and was published in 2011 by Oberon Press. Future projects include a second collection of short stories, a book of essays about France and odd sports, and a superhero-themed literary anthology. He also recently received a Canada Council grant to work on a novel. Dr. Freeze organizes Ultimate Frisbee competitions on the College mall, which is one of the many things he enjoys about teaching at Wabash. “I like being able to play pick-up sports with students and have them (gratefully) drop the ‘professor’ bit and call me by my last name: Freeze! I enjoy my wonderful colleagues, the good conversations, the compactness of our campus. I like our beautiful brick buildings and the aesthetics of the grounds (who says that men can't match!). When writer Aritha van Herk visited, she said everything felt like a movie set, it was that perfect. I also like how it's become increasingly family friendly — that I can take my kids to soccer games or Wabash productions or fraternity dinners and feel like I'm at home, Dr. Freeze said. 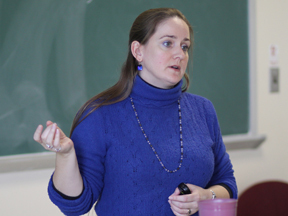 Dr. Karen Gunther is the 16th woman to earn tenure at Wabash, where she began teaching in 2007. She is a graduate of Oberlin College and her master’s degree and PhD from the University of California San Diego, where she completed a Cognitive Science Interdisciplinary Program with a focus on psychology and neuroscience. Prior to her arrival at Wabash, Dr. Gunther spent four years as in a post-doctoral fellowship at the Medical College of Wisconsin. Dr. Gunther’s primary research focuses on color vision. The type of research she conducts, psychophysics, is at the intersection of psychology, biology, and neuroscience — human behavioral responses to visual stimuli are used to elucidate the underlying neural mechanisms. 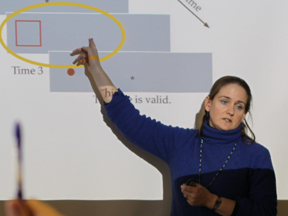 Dr. Gunther teaches a range of courses, including Sensory and Perception, Cognitive Neuropsychology, Neuroscience, and Research Methods and Statistics. She has taken Wabash students to conferences to present their research, both regional undergraduate conferences and national professional conferences. “I really like the research-emphasis we now have in the Psychology Department, and the ability to do our own research in collaboration with students in the capstone course,” Dr. Gunther said. Professor Gunther is also studying teaching and learning, and is examining the use of non-fiction novels as the textbooks for teaching Sensation and Perception — to give the students more of a story line on which to hang the facts presented in class lectures. “At Wabash the decision to grant tenure to a faculty member is a very serious one that involves periodic formal reviews over a number of years and input from colleagues in the department, faculty from across the campus, students, and alumni,” said President White. “Wabash undertakes this time consuming process so that we might be always assured that faculty awarded the great prize of tenure have shown not only what they have accomplished, but what they will continue to do as leaders of the College. The promotion to Associate Professor is effective July 1, 2013.